“Satellites have an enormous amount of potential to help index insurance scale up across the developing world. They are far from being magic, but they aren’t garbage either,” — Dan Osgood. The International Research Institute for Climate and Society (IRI) and the National Aeronautics and Space Administration’s (NASA) Goddard Space Flight Center are collaborating on a project that brings together climate science, economics and remote sensing expertise to focus on providing scalable datasets that can be used in agriculture insurance programs. The project seeks to provide a multi-resolution, multi-sensor source of weather and climate information that will enable the expansion of an agriculture insurance program that provides basic weather-risk financial support. Ultimately, the research outcomes from this project will affect thousands of farmers who participate in index insurance across the African continent. As the use of satellite imagery in insurance applications becomes more widespread, it is critical that the interpretation of environmental information is reliable. The Financial Instruments Sector Team at the IRI, lead by Dan Osgood, PhD, has played an integral role in index insurance projects across Africa, with partners such as the R4 Rural Resilience Initiative in Ethiopia, US Agency for International Development’s Bureau for Economic Growth, Education, and Environment, NASA SERVIR, ACRE (a company formed through the Syngenta Foundation), and the Global Index Insurance Facility (GIIF). This project is designed to take advantage of new partnerships with remote sensing scientists to ensure that the most appropriate products are being used on local and continent-wide scales. 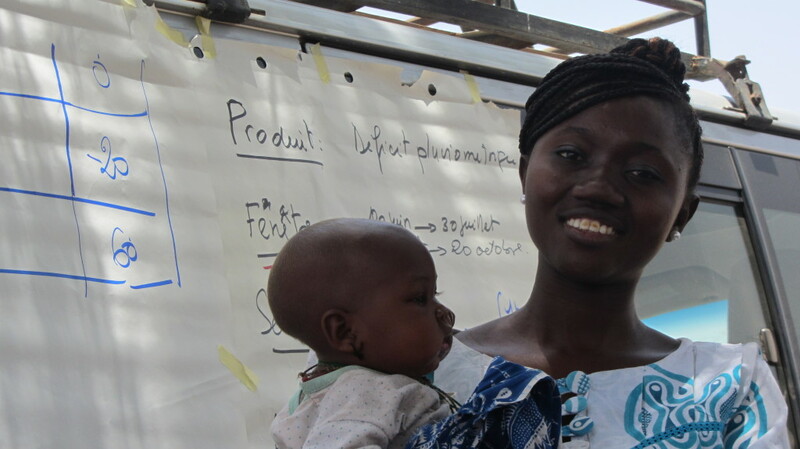 The project expands on recent efforts to thoroughly examine the use of satellite products in index insurance programs with ILO’s Microinsurance Innovation Facility. The IRI has also conducted research with partners at the Weather Risk Management Facility on the use of satellite imagery, specifically vegetation indices and rainfall estimates, in triggering payouts and verifying the accuracy of payouts in index insurance. As the use of satellite imagery in insurance applications becomes more widespread, it is critical that the interpretation of environmental information is reliable. “Satellites have an enormous amount of potential to help index insurance scale up across the developing world. They are far from being magic, but they aren’t garbage either. We’re doing the work to get the most out of the imagery, taking advantage of the strengths of each derived product,” said Osgood. Droughts and high temperatures that come from climate variability have significant impacts on the agricultural sector. Both local and global impacts on production of food will challenge the ability of Africans to meet the need of growing populations. The most vulnerable and food insecure regions of the world need financial tools to reduce the risk of food production shortages while enabling opportunities for productivity increases. Using a remote sensing-based index will allow farmers to access insurance products across diverse regions and agro-ecosystems. As the use of satellite imagery in insurance applications becomes more widespread, it is critical that the interpretation of environmental information is reliable. There are many types of satellite-derived products available, each with their own location-specific advantages and disadvantages. In collaboration with our project partners we will explore five different physical/environmental variables, including evapotranspiration, rainfall, soil moisture, vegetation and landscape characteristics. Using several aspects of drought evidence is particularly important because drought may affect farmers differently depending on their soil type, location and crop. Very high resolution imagery with spatial resolution of a meter or less allows for the identification of field boundaries and to downscale coarse resolution drought information to the village level. False color composites emphasize vegetation in bright green hues. 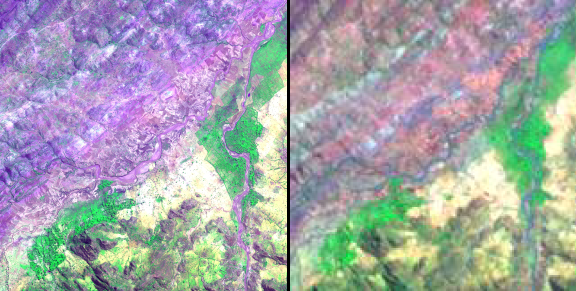 Very high resolution image (left) from the GeoEye-1 commercial satellite and moderate resolution image (right) from NASA satellite Landsat TM were taken of Adi Ha village, Tigray, Ethiopia. Copyright 2011, DigitalGlobe (left image). As another part of our project, our partners at the Michigan Tech Research Institute will develop mobile, tablet, web and text messaging-based platforms to collect information from farmers, extension agents, economists, and scientists in the field to inform remote sensing analyses and agricultural monitoring. Partners at the USDA Agricultural Research Service will provide evaporative stress index (ESI) estimates from the Atmosphere-Land Exchange Inverse (ALEXI) model, which are in the process of becoming operational and available in real time. ESI is able to robustly measure vegetative stress before vegetation turns brown, and can identify the point in time in the crop cycle that this occurs. Agricultural extension agents, like those employed by REST in Ethiopia, will have the opportunity to collect information from the fields that can improve the model’s performance in the region of interest. Climate Hazards IR Precipitation (CHIRP) with Stations (CHIRPS)is a nearly global precipitation dataset provided in 5-day time steps called pentads. CHIRP(S) consists of infrared precipitation estimates based on geostationary infrared satellite observations, monthly gridded climatologies, and local station observations. Our partners at the Climate Hazards Group at UC Santa Barbara will assist in the analysis and incorporation of the CHIRPS dataset into current index insurance projects, to broaden the rainfall estimates already in use. Ultimately this product can link, for instance, a 1 in 5 drought to a specific amount of rainfall at a given location. These datasets are already used in our validation processes, however they will be reexamined at different spatial and temporal scales and analyzed in comparison to soil moisture, ESI, and precipitation products. Our partners at NASA will give us access to a variety of products from sensors that measure moisture in the soil, penetrating cloud cover that often obscures imagery in the visual spectrum. All of these products are designed with agricultural monitoring in mind, and the soil moisture information is specifically relevant to cultivated areas. Ranging across different spatial resolutions, the combination of these products will provide a time series dating 30+ years. Through an agreement between the National Geospatial Agency (NGA) and NASA, we will have access to an abundance of high spatial resolution imagery acquired by commercial satellites such as IKONOS-2, GeoEye-1, Quickbird-2, and WorldView-1 and 2. This imagery will be used to identify field boundaries between irrigated versus non-irrigated agriculture and cultivated versus natural vegetation, which can ultimately improve the ability of index insurance programs to understand the relationship between what occurs on the ground and what satellites can measure. Bristol Mann and Radost Stanimirova contributed to this page.